Ivacevičy (Belarusian: Івацэвічы, Russian: Ивацевичи, Polish: Iwacewicze, Lithuanian: Ivasevičai) is a city in the Brest Province of Belarus, an administrative center of the Ivacevičy district. 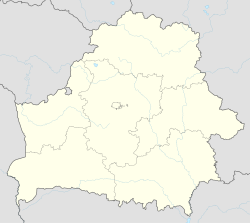 Before the Nazi-Soviet invasion of Poland, Iwacewicze was a provincial city in the Second Polish Republic, the seat of Kosów county with the population of around 1,500. It belonged to Polesie Voivodeship region of eastern Kresy, with a notable Jewish population. Following the invasion, the number of Jews in Iwacewicze greatly increased due to influx of refugees from Nazi-occupied western part of Poland. After the German attack on USSR in June 1941, the Nazis carried out mass executions of Jews at the Żwirownia gravel pit nearby. Under a strong German guard, Jews were marched out of town and separated into smaller groups. They were shot in waves over the already dug-out pits. Before 1944, the Nazis executed there more than a thousand innocent victims including prisoners of war. In 1941 soon after the Nazi takeover of Iwacewicze, a ghetto was set up for about 600 Jews. They were fed starvation rations and forced to perform slave labor. On 14 March 1942 the ghetto was liquidated. All inmates were marched on foot to the Słonim Ghetto, and over the course of several months murdered there. After the liberation, in Soviet Belarus the area of the mass graves in Ivatsevichy was used to extract sand. During mining, the bones of the dead were constantly being unearthed, until finally in the 1960s, a stone memorial was placed at the pits, marking the already mined graves. ^ "World Gazetteer". Archived from the original on January 11, 2013. ^ "Weissruthenien region. "Iwacewicze"". The United States Holocaust Memorial Museum Encyclopedia. Indiana University Press. p. 1200. Retrieved April 11, 2012. ^ a b "Iwacewicze. Ul. Czartkowa - miejsce egzekucji i zbiorowa mogiła ofiar Zagłady". Virtual Shtetl. Museum of the History of Polish Jews. Retrieved April 11, 2012. ^ "Getto w Iwacewiczach". Virtual Shtetl. Museum of the History of Polish Jews. Archived from the original on March 4, 2016. Retrieved April 11, 2012. This page was last edited on 6 January 2018, at 17:46 (UTC).